Map indicating the Mariana Islands, Guam, and Iwo Jima in the Pacific Ocean. Jack Miller Fletcher was born September 21, 1925, in Spur, Texas (240 miles west of Dallas, Texas). After the December 7, 1941, surprise Japanese attack on Pearl Harbor, Hawaii, Jack went to Dallas to join the United States (US) military. After the train with new recruits left Dallas with a destination of California for military training, Jack’s father stopped the train at Sweetwater, Texas (212 miles west of Dallas), told the military authorities that Jack was underage to enlist, and took him home. Later in 1942 after Jack turned 17 years old, his father signed the paperwork permitting him to enlist. Jack left high school a semester before graduating and joined the US Navy. 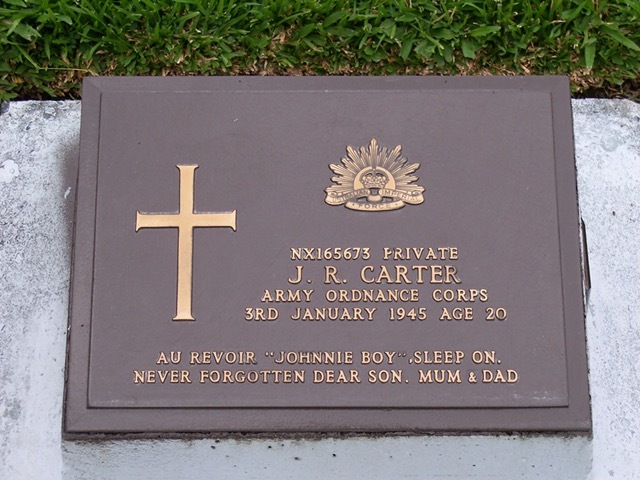 [Jack had three older brothers who also served in WWII]. Jack trained as a US Navy hospital corpsman and was assigned to the US 3rd Marine Division. Second Battle of Guam (July 21 – August 10, 1944). 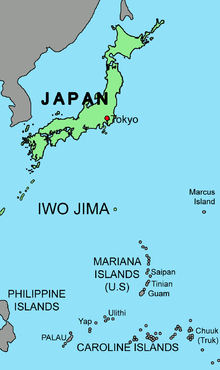 The island of Guam in the Pacific Ocean Mariana Islands had been a US possession since 1898. The Japanese captured the island in the First Battle of Guam (December 8 – 10, 1941). Jack landed on Guam several days after the initial US assault on July 21, 1944. While on Guam Jack tells the story of a local family who asked his help to deliver a baby. He hadn’t received training in that area, and all he knew was what he had seen in American movies when an actor would say “tear up the sheets and boil some water.” The family followed Jack’s instructions. Jack was organizing his torn sheets and boiling water when a family member delivered the baby. The sheets that were torn up were never needed, and Jack learned that they were the family’s best ones that had been buried with other valuables in December 1941 so the Japanese could not confiscate them. After the US capture of Guam, the island was used for training exercises in preparation for the Battle of Iwo Jima. In Jack’s 2013 oral history interview with the National Museum of the Pacific War in Fredericksburg, Texas, he tells a story of the unimaginable bravery and courage of a fellow hospital corpsman who died in a training accident on Guam on December 3, 1944. The hospital corpsman’s name was David L. Demarest. He was 20 years old. During the training exercise the shell of an anti-tank 105mm gun fell short and landed in the midst of the marines. David Demarest’s jaw was blown off in the explosion. In an attempt to prevent himself from swallowing his tongue after the injury, David took a safety pin and put it through his tongue and then pinned his tongue to his cheek. In spite of his serious injury he continued to treat the wounded and the dying until he too died. Jack said 30 – 40 marines were killed or wounded in the exercise. Battle of Iwo Jima (February 19 – March 26, 1945). Jack was assigned as a hospital corpsman on a US Navy attack transport ship (APA 89) named the United States Ship (USS) Frederick Funston. APA 89 had transported troops from Guam to Iwo Jima for the battle. Her troops were initially held in reserve and landed on Iwo Jima February 27, 1945. Jack spoke of two medical treatments that became available to treat casualties on Iwo Jima; the availability of penicillin and whole blood saved many lives. He also tells of the unique medical challenge of open wounds that became contaminated with the island’s volcanic ash. Jack says it could turn a wound gangrenous in 24 hours. That resulted in many amputations. Battalion aid stations on the beach became targets for the Japanese. It was decided to move American medics and casualties as quickly as possible out to ships for treatment. Jack still gets emotional when he speaks of being surrounded by dying and wounded men as he worked to save lives. In Jack’s 2013 interview he shared the tragic story of a marine he treated on the USS Frederick Funston. His name was Sergeant (Sgt) Charles C. Anderson, Jr., who was assigned to the 25th Marine Regiment, 4th Marine Division. His two legs and arms were blown off when a mortar landed between his legs on Yellow Beach. The young marine remained conscious during part of his medical treatment, and Jack said Charles would make jokes wondering if he could get dates after the war. The medics were able to keep him alive for 16 hours before he died of his wounds. The death of Sgt Charles C. Anderson, Jr., was an especially sad one. In one of WWII’s dramatic ironies, the captain of the USS Frederick Funston was Charles C. Anderson, Sr. A father signed his own son’s death certificate. On March 8, 1945, the USS Frederick Funston left Iwo Jima waters to transport the casualties they had on board to Guam for further treatment. Jack was on Guam when he heard US President Franklin D. Roosevelt died on April 12, 1945. He said he and many of the men “cried like babies” when they heard the news. Training had already begun on Guam for the planned Invasion of Japan scheduled for November 1945 when he heard WWII had ended. Their objective would have been to land on Kyushu, Japan’s third largest island. After WWII ended it became a priority to transport American military personnel back to the US. The plan called Operation Magic Carpet (October 1945 – September 1946) returned eight million Americans from the Pacific, European, and Asian Theaters. Jack was assigned to the operation and made three Pacific crossings with US repatriated military personnel. Jack was discharged from the US Navy in November 1946. 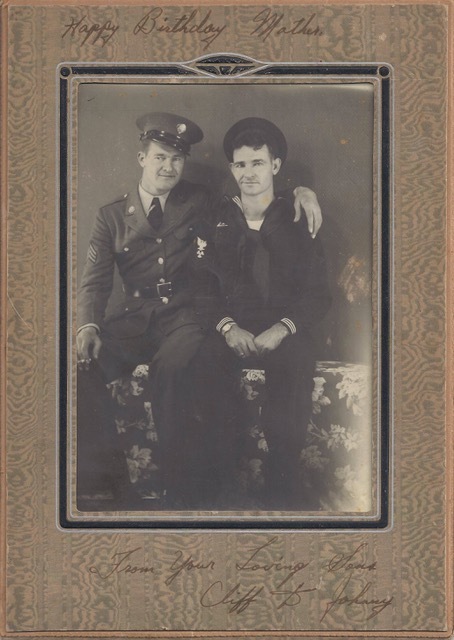 His three brothers survived WWII and returned home, but his younger 17 year old sister, Joyce Ann, had been killed in an automobile accident in Texas during the war. Jack spoke of having nightmares for several years after WWII ended. After WWII Jack used the GI Bill to attend Sul Ross State University in Alpine, Texas. He graduated in 1949 with a Degree in Agriculture. In 2012 Jack was invited back to Spur, Texas, to receive his high school diploma. 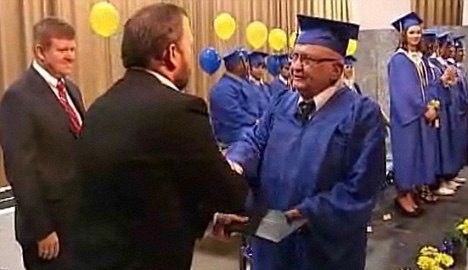 After seventy years he officially graduated from high school. Jack Fletcher receives his Spur High School Diploma. May 29, 2012, Spur High School graduation photo courtesy of Spur Independent School District. During WWII Jack learned about Australia when he traded beer rations with Australian soldiers. He would later move to Australia and began a business that changed the field of agriculture in Western Australia. The Australian government awarded him the Order of Australia Medal for his work. For more information on Jack’s legendary career in the agriculture industry see http://www.cbs7.com/content/news/Sul-Ross-alum-Jack-Fletcher-receives-Order-of-Australia-medal-416627143.html and https://www.tradeearthmovers.com.au/features/1507/jack-fletcher-the-texan-kimberley-king. 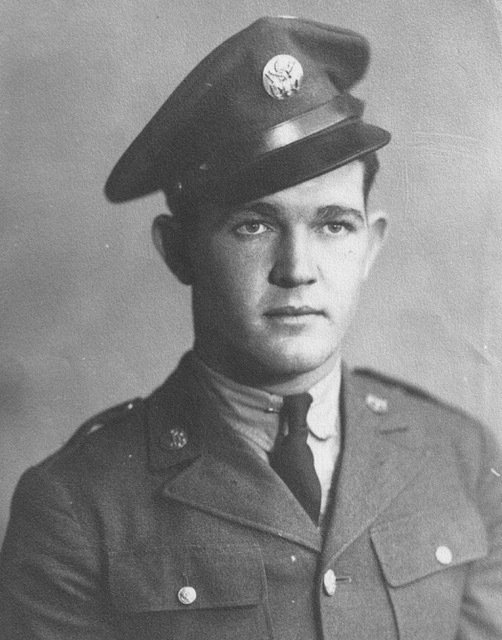 Jack Miller Fletcher’s full interview can be found in the digital archives of the National Museum of the Pacific War in Fredericksburg, Texas. He was interviewed by museum oral historian Floyd Cox. The link is http://digitalarchive.pacificwarmuseum.org/cdm/compoundobject/collection/p16769coll1/id/4236/rec/1. Thank you to WWII historian and researcher Sue Moyer. The Bita Paka War Cemetery was established by the Army Graves Service in 1945 and is managed by the Commonwealth War Graves Commission. There are 1,120 WWII Commonwealth burials in the cemetery. 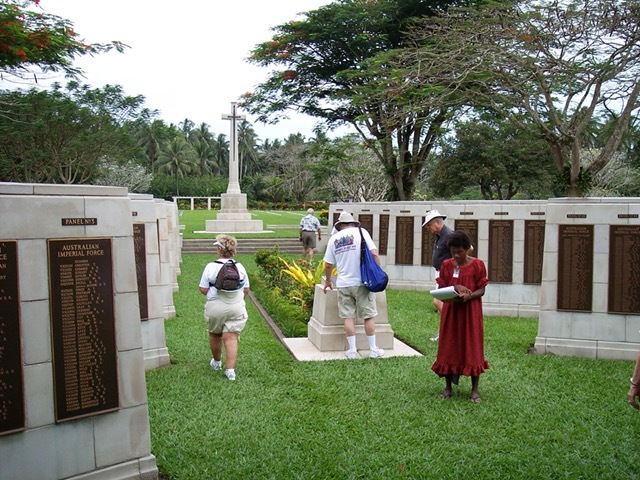 The Commonwealth War Graves Commission (CWGC) cares for WWI and WWII cemeteries and memorials in 154 countries in 23,000 locations. Members of the Commission are Australia, Canada, India, New Zealand, South Africa, and the United Kingdom. Sir Fabian Ware, the commander of a British Red Cross mobile unit in WWI, had the vision to commemorate the men and women who had sacrificed their lives in WWI. In 1917 a Royal Charter established the Imperial [now Commonwealth] War Graves Commission. The Commission established high standards as work began to design and construct memorials and cemeteries. A literary great of the day, Rudyard Kipling, advised in the selection of inscriptions for the Memorials. Over 54,000 names of the missing are engraved on panels of the Memorial. The CWGC later extended its responsibility to include the war dead of WWII. The CWGC has ensured that 1,700,000 men and women lost in WWI and WWII will not be forgotten. In the United States there are 1,026 graves in 47 States that are commemorated by the Commission. For more information about the Commonwealth War Graves Commission visit website http://www.cwgc.org/about-us.aspx. Rabaul, a town in East New Britain, Papua New Guinea, was a Australian naval base that was captured by the Japanese in 1942. It became a major Japanese air and naval installation and was the most heavily defended Japanese fortification in the South Pacific. 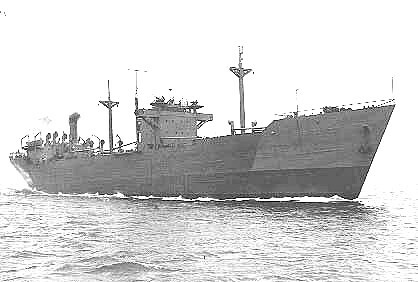 It was the assembly point for convoys of ships, known as the “Tokyo Express,” that would race south to bring troops and supplies to areas of conflict in the Solomon Islands such as Guadalcanal. Operation Cartwheel (1943 – 1944) was a major Allied plan to neutralize and then to isolate and bypass Rabaul as the Allies moved northward towards Japan. Allied bombers and fighters first attacked Rabaul in December 1943. Continuous Allied air attacks on Rabaul rendered it essentially useless in February 1944. Bombing runs over Rabaul continued until August 1945 when Japan surrendered. Private First Class James Donald Jones, US Marine Corps. On a 2005 WWII in the Pacific cruise I met many WWII veterans who shared their personal experiences in conversations, lectures, and veteran round table discussions. The trip began in Honolulu, Hawaii, made stops at Midway Island, Majuro, Guadalcanal, Rabaul, Guam, Saipan, Iwo Jima, Okinawa, Nagasaki, and ended in China. This post is about one of the WWII veterans I met on that trip. James Donald “Don” Jones was born in Eastland County, Texas, on November 14, 1923. He enlisted in the United States (US) Marine Corps days after the Japanese surprise attack on Pearl Harbor, Hawaii, on December 7, 1941. By the end of WWII Don was a veteran of Tulagi (August 7- 9, 1942), Guadalcanal (August 7, 1942 – February 9, 1943), Tarawa (November 20-23, 1943), Saipan (June 15 – July 9, 1944), and Tinian (July 24 – August 1, 1944). These are some of the stories Don shared on the trip. Background. On August 9, 1942, in the aftermath of the catastrophic defeat of the US Navy at the Battle of Savo Island, US transport ships carrying men, rations, ammunition, gasoline, and other supplies left for safer waters to protect US carriers. Supply lines to US troops on Guadalcanal were cut off for months as a result. After first landing on the island of Tulagi, Don and the 2nd Marine Division were sent to Guadalcanal to defend a ridge perimeter around the airfield. Don spoke of the hardships on Guadalcanal due to malaria, dysentery, tropical diseases, jungle rot, and malnutrition. The Marines nicknamed the island “Survival Island.” Before US supplies began arriving again, they were surviving on rice stolen from the Japanese and native island food sources such as heart of palm. Don said he never ate heart of palm again after that. 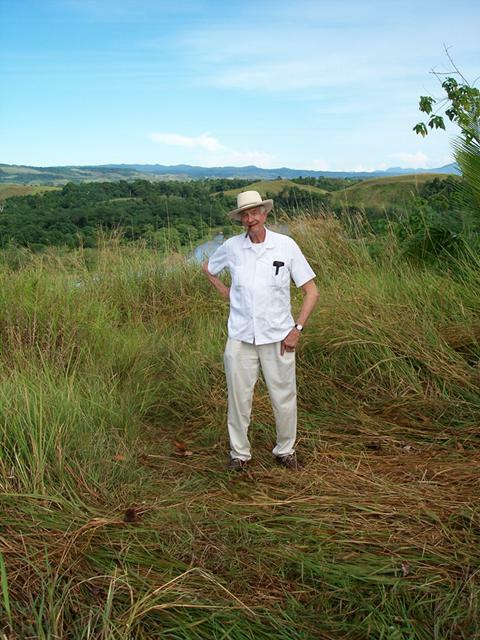 Don spent much of his time on Guadalcanal in a foxhole on Bloody Ridge (also known as Edson’s Ridge) overlooking the airfield (Henderson Field). The extreme heat and humidity resulted in leather boots rotting off the feet of some Marines. While in his foxhole Don made a promise to himself; if he lived through the war, one day he would return to Guadalcanal and smoke a cigar on Bloody Ridge. June 9, 2005, Guadalcanal, Solomon Islands. Don smokes a cigar on Bloody Ridge. 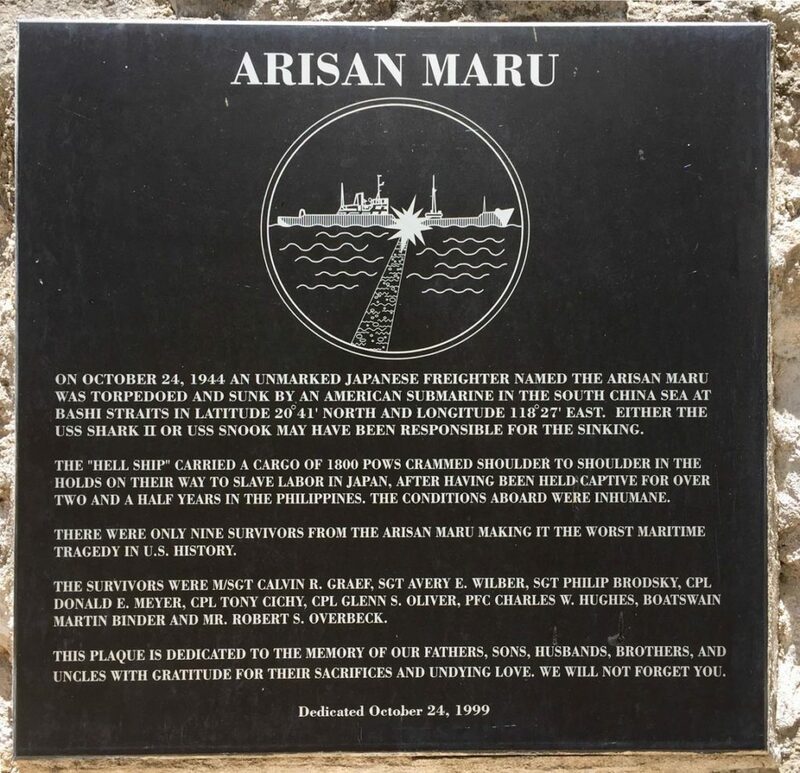 June 16, 2005, Saipan, Commonwealth of the Northern Mariana Islands. Don and his daughter, Nancy, at the American Memorial Park. 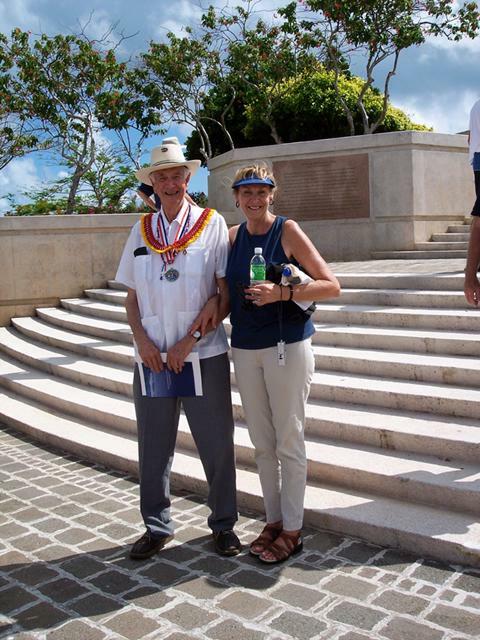 During the stop in Saipan there was a program at the Memorial honoring WWII veterans. Don spoke at the ceremony and afterwards was interviewed by a Japanese news crew. On June 15, 1944, Don landed with the 2nd Marine Division on “Green Beach” along the southwest coast of Saipan. Continuing north Don saw the overwhelming aftermath of the largest Japanese Banzai charge (suicide attack) of WWII on July 7, 1944. He said there were thousands of dead Japanese soldiers. The flies there were so thick that a plane had to spray DDT over the area. On the northern tip of Saipan at Marpi Point Don witnessed civilian men, women, and children commit suicide jumping off the cliffs. The island of Tinian is visible from Saipan. Don landed there in July 1944. Don was wounded on Tinian and evacuated to a battalion aid station. He said the flies were so bad there that he asked to return to the front lines. By the time Don left Saipan and Tinian, he had seen civilians jump to their deaths on both the northern cliffs of Saipan and the southern cliffs of Tinian. After three years in the Pacific Theater, Don was stationed in Washington, DC, standing guard outside the office of Fleet Admiral Ernest J. King, Chief of Naval Operations in WWII. Don was in Washington, DC, when the war ended. Nancy, Don’s daughter, wrote, “James D. Jones was discharged in October 1945. On his way to the bus stop he nearly cried. He had only been a Marine. For the last four years it wasn’t easy, but everything you needed, they provided. He had a wife and baby waiting in Texas. What would he do now?” It was a shared sentiment felt by many who survived the war and were returning to the challenge of reentering civilian life. James Donald “Don” Jones died in 2008 and is buried in his hometown of Eastland, Texas. He was a proud Marine his entire life. “Midway Atoll: WWII and Present Day,” a story about the first stop on a 2005 WWII in the Pacific cruise, was posted on this website in November 2015. Story link is https://www.ww2history.org/war-in-the-pacific/midway-atoll-wwii-and-present-day/ . 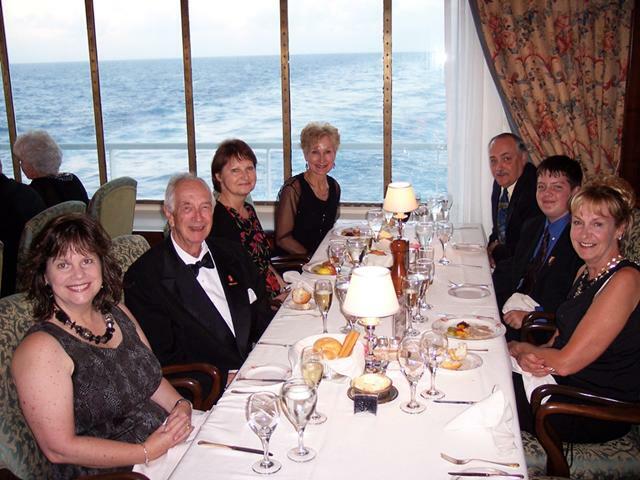 Our Valor Tours group at dinner table 32 on the Pacific Princess cruise ship. We were strangers when we started the trip in Honolulu, Hawaii, and family when we disembarked in China. 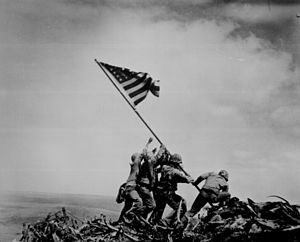 Associated Press photographer Joe Rosenthal’s iconic picture of the raising of the US flag on Mount Suribachi on February 23, 1945. It was the first time during WWII that the American flag flew on Japanese soil. Iwo Jima, known as Sulfur Island in Japanese, is eight square miles in size and 660 miles south of Tokyo, Japan. The American invasion of Iwo Jima, designated Operation Detachment, took place from February 19 – March 26, 1945. The island was of critical importance as a staging area for attacks on the Japanese main islands. Arnold “Arnie” Cole was born to homesteaders in Beulah, North Dakota, on October 9, 1924. The family later moved to Wyoming and then to Billings, Montana, where he lived when he heard about the Japanese surprise attack on Pearl Harbor, Hawaii, on December 7, 1941. He was only 17 years old. His father signed a consent form, so he could enlist. Arnie joined the United States (US) Navy. The first day of the Battle of Iwo Jima, February 19, 1945, Arnie landed on the island. US Navy corpsmen were issued a .45 caliber pistol, and Arnie managed to “grab” a .30 caliber M-1 Garland rifle also. He explained in his interview the danger corpsmen face. Interviewer: Did you get an opportunity to use your weapon or your forty-five or anything or were you just tending mostly wounds? Mr. Cole: No, both ways. I had picked up a little .30 caliber rifle, and I took all my stuff that identified me as a corpsman, threw it all away, and got me a bag and put all my stuff in a bag. Interviewer: Did they single out corpsmen trying to shoot them? Mr. Cole: They got corpsmen first. Interviewer: Is that right? Is that because he’s supposed to take care of the others? Mr. Cole: When they got one corpsman, they got 25 marines. Arnie moved with the marines from the southern Mount Suribachi area of the island up to the Japanese airfields in the middle of the island and then beyond. His 33rd day on Iwo Jima he was shot. Interviewer: Oh, you say you got hit? Mr. Cole: Oh, yes, I got shot. An Arisaka got me. Mr. Cole: Got me in the chest. Interviewer: Oh, right in the chest. Mr. Cole: I’m a company aid man. I do what the hell has to be done, so I immediately stuck a rock in the hole in my back and laid back on it. I had a sucking chest wound, so I had to lay back, and I held my hand over the hole in the front so I could breathe. The hospital corpsman is a god, you know, we’re treated like kings by the Marine Corps. They immediately grabbed me and threw me into a poncho and took me out of there. That was back to a battalion aid station. Then his life was saved again by a twist of fate. Interviewer: Did you go to a hospital ship when they took you offshore? Interviewer: They had one there? Mr. Cole: No, I went back to a battalion aid station, and then they put me on the USS Queens which was a converted transport ship to a hospital ship. From there, they took me back to Guam. I was bleeding so bad and was losing so much blood that the doctor dumped two of us off at Guam. He didn’t want to bury us at sea. He dumped us off on gurneys. They rolled the gurneys into the morgue. What happened with me is somebody, I’m told, heard me groan or grunt or something, and they grabbed me and hauled me back in. When they found me, I had a green tag tied to my toe, dead. Arnie stayed on Guam for a time and then was transferred to Pearl Harbor, Hawaii, and on to San Diego, California. He spent two years in US Navy hospitals recovering from his wounds. Arnie was 20 years old when he was shot on Iwo Jima. He lost his right lung, eight ribs, and shoulder girdle. And during his interview with the museum he said, “I lost three companies of men” [that he could not save]. Twenty-seven Medals of Honor were awarded for the Battle of Iwo Jima. Fourteen of the Medals of Honor were awarded posthumously. US Secretary of the Navy, James V. Forrestal, was on the island on D-Day plus four (February 23, 1945) and witnessed the raising of the US flag on Mount Suribachi. The US military occupied Iwo Jima until 1968 when it was returned to Japan. Arnold Cole’s full interview can be found in the digital archives of the National Museum of the Pacific War in Fredericksburg, Texas. The link is http://digitalarchive.pacificwarmuseum.org/cdm/search/searchterm/Arnold%20Cole/order/nosort. 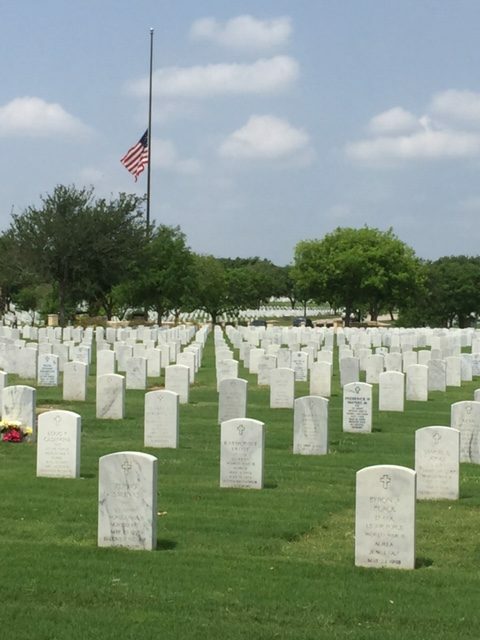 Burials at Fort Sam Houston National Cemetery in San Antonio, Texas, began in 1926. The cemetery encompasses 154.7 acres with over 150,000 burials. 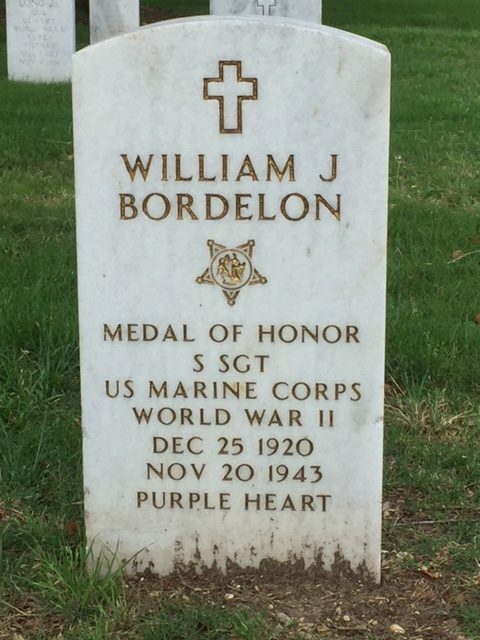 Staff Sergeant William James Bordelon, United States Marine Corps, WWII. Hometown: San Antonio, Texas. December 7, 1941, the Japanese attacked Pearl Harbor, Hawaii. President Franklin D. Roosevelt requested from the United States Congress and received a declaration of war against Japan on December 8, 1941. December 10, 1941, a young man named William James Bordelon from San Antonio, Texas, enlisted in the United States Marine Corps. 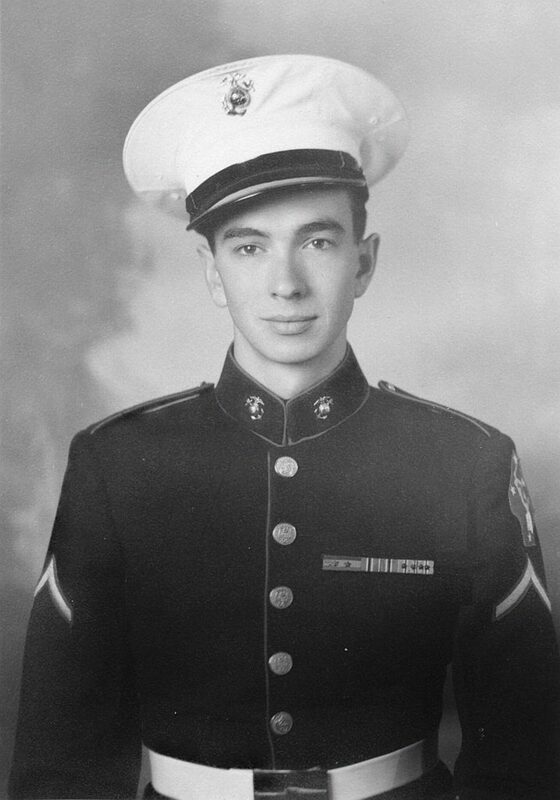 A graduate of Central Catholic High School in San Antonio, he and two other graduates of the high school would lose their lives in the Pacific Ocean on an atoll known as Tarawa in the Gilbert Islands during the 76 hour Battle of Tarawa which took place from November 20 – 23, 1943. On November 20, 1943, Staff Sergeant (S/Sgt) Bordelon was aboard the United States Ship Zeilin awaiting the order to begin the assault on Tarawa. The assault began just after 5 am. The Japanese had occupied Tarawa Atoll since 1941. It was heavily defended and fortified with pillboxes, bunkers, and barbed wire. Ocean tides and a coral reef caused extreme difficulties during the landings. For his action during the Battle of Tawara, S/Sgt. Bordelon was posthumously awarded the Congressional Medal of Honor. For valorous and gallant conduct above and beyond the call of duty as a member of an assault engineer platoon of the 1st Battalion, 18th Marines, tactically attached to the 2d Marine Division, in action against the Japanese-held atoll of Tarawa in the Gilbert Islands on 20 November 1943. Landing in the assault waves under withering enemy fire which killed all but 4 of the men in his tractor, S/Sgt. Bordelon hurriedly made demolition charges and personally put 2 pillboxes out of action. Hit by enemy machinegun fire just as a charge exploded in his hand while assaulting a third position, he courageously remained in action and, although out of demolition, provided himself with a rifle and furnished fire coverage for a group of men scaling the seawall. Disregarding his own serious condition, he unhesitatingly went to the aid of one of his demolition men, wounded and calling for help in the water, rescuing this man and another who had been hit by enemy fire while attempting to make the rescue. Still refusing first aid for himself, he again made up demolition charges and single-handedly assaulted a fourth Japanese machine gun position but was instantly killed when caught in a final burst of fire from the enemy. S/Sgt. Bordelon’s great personal valor during a critical phase of securing the limited beachhead was a contributing factor in the ultimate occupation of the island, and his heroic determination throughout 3 days of violent battle reflects the highest credit upon the U.S. Naval Service. He gallantly gave his life for his country. S/Sgt. 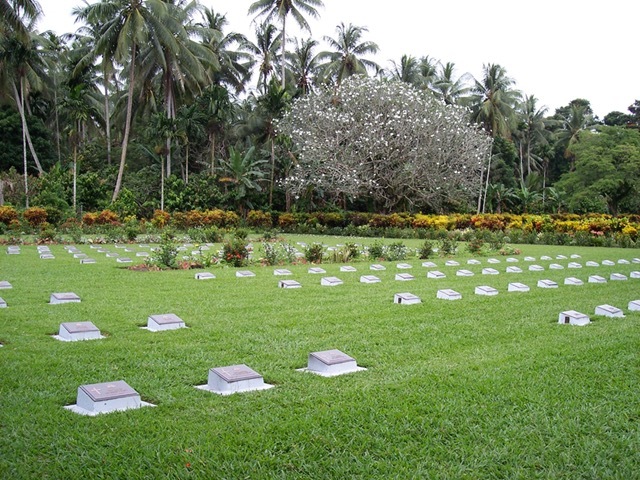 Bordelon was initially buried in Lone Palm Cemetery on Betio Island, Tarawa Atoll. After WWII ended his remains were moved to the National Memorial Cemetery of the Pacific in Honolulu, Hawaii. In 1995, 52 years after his death on Tarawa, at the request of his family he was returned to his hometown of San Antonio, Texas. Prior to his burial at Fort Sam Houston National Cemetery, S/Sgt. Bordelon received an honor granted to only four people before him. He laid in state inside the Alamo Mission in San Antonio, Texas. Fort Sam Houston National Cemetery, San Antonio, Texas. Gene Seng, Jr. and Charles Montague were the two other graduates of San Antonio, Texas, Central Catholic High School to lose their lives during the Battle of Tarawa. Four Congressional Medals of Honor (MOH) were awarded for the Battle of Tarawa. In addition to S/Sgt. Bordelon, First Lieutenant Alexander “Sandy” Bonnyman, Jr. and First Lieutenant William Dean Hawkins were posthumous recipients of the MOH. Colonel David Monroe Shoup survived the Battle of Tarawa and was also awarded the MOH. 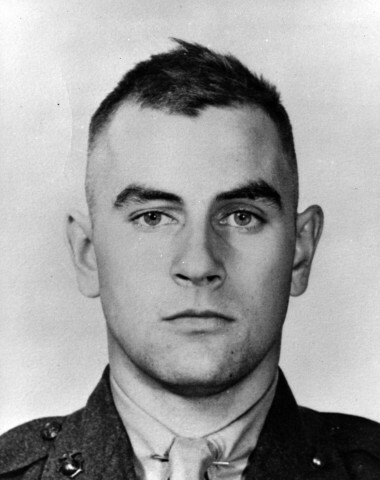 He later became the 22nd Commandant of the Marine Corps. The other individuals who have lain in state inside the Alamo Mission in San Antonio, Texas, were MOH recipient (Philippine-American War 1899 – 1902) Major General Frederick Funston, MOH recipient (WWI) Private David B. Barkley, Mrs. Antoinette Powers Houston Bringhurst (daughter of Samuel “Sam” Houston, the first President of the Republic of Texas), and Mrs. Clara Driscoll (philanthropist and historic preservationist who provided the money to preserve the Alamo Mission). Thank you to Leslie Sitz Stapleton, Director, Daughters of the Republic of Texas Library at the Alamo.